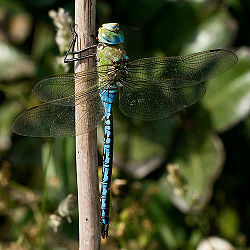 The Emperor Dragonfly is a species of dragonfly known by the scientific name Anax imperator . Its extravagant colors of sky blue and bright green gives it the appearance of royalty from which its name is derived. 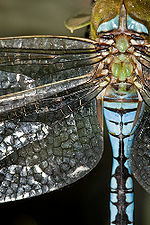 Close up of Emperor dragonfly anatomy. Male emperor dragonflies are highly territorial protecting his pond from other male dragonflies. They arrive usually taking over the hairy dragonflies territory because the hairy dragonfly reaches the extent of their season. The male dragonfly is usually found in the air looking for a female, food or intruders. If intruders are found then the male will fly underneath him until forced to leave his territory. Dragonflies territory can be up to fifty meters of stagnant water. Sometimes if found an intruder their can be battles between dragonflies over territory. reference title author, publisher, date. The Emperor Dragonfly by AllSands. The Emperor Dragonfly by Absolute Astronomy, 2009. The Emperor Dragonfly by BDS. This page was last modified on 20 December 2010, at 11:40.